1 hard-to-find dagger blade U.S. World War 2 Richtig fighting knife w/Cornish sheath. This knife is also ID'd, and has provenance to the veteran who carried it. In addition, there is also a document of interest to Richtig collectors. 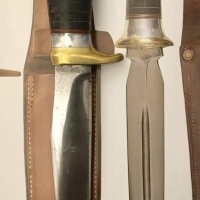 This desirable Richtig fighting knife would make an important addition to any U.S. military or world militaria collection. 1. A double-edged Richtig fighter is pretty hard to find. 2. This knife is ID'd to the vet who carried it during the War. The sailor, Ralph Benson, put his name on the guard. The provenance documents included with this knife are a newspaper clipping of his wedding announcement; a newspaper clippingphoto of him with his bride with a caption; his Company 69, 2nd Battalion, 1st Regiment class photo. This Richtig fighter measures 11" overall. The blade itself measures 6 1/8". This Richtig fighter is marked on the pommel 'F.J.R. CLARKSON NEB.'. The guard and pommel are brass. The pommel has an extended lanyard ring--with its original leather wrist thong. This WW2 Richtig fighting knife shows both honest signs of carry in World War 2, and exceptional condition. A Richtig knife can take an edge like no other. The handle is in beautiful condition. The blade has some occasional carbon staining. I know a few collectors who buy a Richtig fighter and carefully clean up the blade right away--they love the look of a Richtig fighting knife that looks like it was just made. But others want the knife as it was found, so I haven't touched it--the blade would clean up nicely with simply some Simichrome or Flitz on a rag if the collector wanted to do that. The Cornish sheath is in excellent condition. The keeper strap is intact. The leather wrist thong is still with this knife after all of these years. An original Cornish wrist thong is very difficult to find.